One of the perks of being both a cop and a gun nut is the fact that I occasionally get to enjoy my hobby while getting paid.Â In addition to being a gun nut I am also a self-proclaimed geek.Â I love to research stuff that interests me and my latest research project just happens to combine both work and guns. For years I have heard discussion after discussion about how the .45 ACP is the only true â€œman stopperâ€ round and anything else is just inferior (especially the 9mm).Â These same folks will usually make virtually the same argument about .308 vs. .223 and how the worst decision the US Military every made was switching from the first two rounds I mentioned to the last two I mentioned.Â My most recent run in with this discussion happened in a local gun store not too long ago.Â So after years of hearing this argument my inner geek took over and I decided it was time to do a little ammo research to see how well the ammo I trust my life to works. I started my research with an article in a recent issue of Law and Order Magazine that I receive.Â The author of the article attended a Wound Ballistics Workshop that was sponsored by ammo manufacturer ATK.Â If you are not familiar with ATK they are the parent company of Federal and CCI/Speer.Â The main point I want to highlight from this article is the comparison of bonded ammo to non-bonded ammo.Â The most important thing to consider when talking about bonded or non-bonded bullets is what caliber you choose to carry and what you may end up shooting through.Â ATKÂ says that in velocities over 1000 FPS (so just about everything except .45 ACP) the copper jacket will separate from the lead bullet in a non-bonded bullet when shooting through glass. IfÂ you’veÂ made it this far and you’re asking yourself â€œwhen will I have to shoot through glassâ€ my answer to you is this: What if someone is trying to attack you and youâ€™re still in your car and there is not enough time to get out? Your bullet choice and how it performs going through glass could be the difference between surviving or not.Â So now that we know bonded bullets perform better in certain scenarios, do you know if your chosen defensive round is bonded? Â I will give you a little help and point out that of the two most popular law enforcement duty rounds (Federal Tactical HST and Speer Gold Dot) manufactured by ATK, Federal Tactical HST is not bonded but the Gold Dot is. So now that we know bonded is better letâ€™s tackle the â€œwhich caliber is betterâ€ debate. Two of the most important things to consider are bullet expansion and bullet penetration, and both are far more important than what size the bullet is when it leaves the barrel.Â For this information I again turned to the ATK website and their ballistic testing.Â Below is a chart that shows the test results of the Speer GDHP in the three of the most popular law enforcement and personal defense calibers. When you look at the results of the tests through heavy clothing you will notice that when it comes to penetration the .45 ACP is outperformed by both the 9mm and the .40 S&W. Also, while the expansion values are not significantly different between the .40 and the .45 rounds and the 9mm is really not that far behind either.Â When it comes to stopping a threat expansion is good but penetration is better. Why is it better? Because deeper penetration is more likely to reach vital organs such as the heart, thereby affecting the body’s ability to distribute blood. Affecting the body’s ability to distribute blood is one of the two main ways of physically stopping the human body (“stopping power”), the other being to shut down the central nervous system. The FBI standard for penetration is 12-18 inches, and if you look at the chart all three bullets meet the FBI standard, with the .45 being on the low end, the .40 on the high end, and the 9mm in the middle. I think the best way to sum all of this up is the great caliber superiority debate is dead.Â You should worry more about what type of bullet you are using and less about what size it is. Â The reality is that if you’re using modern hollow point defensive ammo they are all going to perform about the same; and now that we know that we can move on to what is really important: shot placement. The best ammo in the world is only as good as the person behind the gun makes it and ONLY HITS COUNT! Thats the same exact thing I say!!! In the end it usually all comes down to placement. Good article! Great points that i can agree on. I prefer 9mm btw. Great Article! We concur that the size of the bullet doesn’t matter, but it’s the shot placement that counts! To quote a great Massachusetts Firearms Philosopher [Matt Devito]….Only Hits Count”! I’m afraid, after measuring at my thickest part, I’m only about 12″ thick. So I’m calling baloney. The only real measure is what do the people who kill people for a living carry? Answer: whatever they want. M4, M16, SIG 9mm, HK .45, M14, HK416, SCARH in 7.62mm. I bought a .22 Walther for my wife and it’s now my fav carry. Laugh all you want, I don’t want 10 rounds of CCI Stingers in my face–do you? Clothes and barriers slow down the bullet, which is the reason for the standard. measure yourself crosswise, from the outside of one arm to the center of your chest. I imagine it’ll be more than 12 inches. Unfortunately bad guys don’t always stand like targets at the range. The rounds may have to penetrate arms or at odd angles to hit a vital organ. You have to consider not only your body thickness but the body thickness of everyone that you may have to shoot at as well as the density of the additional tissues, bone, etc that the bullet must pass through. The 12-18in is an average and I am sure a 108lb woman is going to be much thinner than a 400lb man when you are talking center mass area. You are forgetting that the FBI standard of 12″ penetration is through BALLISTICS GEL. Your body is not of uniform mass, with there being skin, bones, organs and clothing to consider. The first couple inches of ballistics gel account for just the skin alone. People tend to throw their hands up when they are getting shot at, adding a couple more layers of bones, skin and clothing. There are about a billion factors to consider, since every shooting situation is different. All your measuring experiment has accomplished is making it obvious that you are uninformed, and giving me a hearty chuckle while imagining you hold a ruler to your torso and immediately dismissing all ballistic research from the past 50 years. To a slight degree, there is a mixing of metaphors here. OK, Maybe not metaphors but rather of context. I have served in neither the military nor law enforcement, just to be up front. But I enjoy military history and firearms. During WW2 and Korea, when the calibers were .45acp for pistols and .30 for rifles, the bullets were also FMJ. When the caliber changes were made in Vietnam, for infantry rifles, and subsequently to 9mm for pistols, that is when the debate started raging and I believe it was still in the context of FMJ bullets. Clearly, with today’s technology and the use of expanding bullets in law enforcement and self defense scenarios, the argument definitely changes. So, the question remains, in a military context when using FMJ bullets, do the larger calibers have better stopping power? Well, now we have to discuss what is meant by stopping power. Again, during ww2, what US servicemen found was that the .45 would knock an enemy down (stopping power) when a 9mm would not. Some have claimed the same is true with between the .308 and the .223 today. Anyway, I think people just like to have opinions and debates over the gun counter. Regardless of all of that, I found this article informative and useful. No, the military doesn’t use hollow points. Stopping power in the context of FMJ bullets is going to be relative to many different factors, like distance, twist rate, weapon system, etc, etc. I thought the Geneva convention prohibited hollow points and just recently some of our special ops units went to a hybrid FMJ/hollow point type of bullet that has some nations screaming? You are correct, hollow points are restricted by treaty but it wasn’t the Geneva convention it was the Hague Convention in 1899. Darwin, a .45 can not “Knock” a man down. Otherwise it would knock down the shooter as well. Please reread your physics books. Knockdown power is a myth. A really, really uneducated myth. With today amo I think it really does not matter what you carry. Even the 380 can be effective. I will carry any caliber from a .45 to .380 just depend on what I am doing or what I am wearing. I think what ever you want to carry. Carry it don’t worry about it. Just do your self a favor take it to the range and learn how to use it. Become familiar with the gun so if you are ever in that situation you be able to protect your self. Also make sure you are using the right ammo. Thanks once again for a great and well researched article. The main point of the article was that a “1 stop shot” very rarely if ever happened with ordinary shooters (including LEOs). Therefore, since more than 1 round was required in most situations, it was better for most people to carry a 9mm, .38, .380 or something with less recoil, rather than .40 or .45 since most people don’t practice enough to be able to get back on target quickly for follow up shots with the higher caliber rounds. To me this makes since, but you also need to consider the weapon. I like my 1911’s (full size to compact), and my XD45 (full size) and am very comfortable with them and find it easy to get back on target for follow up shots, but the same cannot be said for the new little XD in .45. Something about the little XD is uncomfortable to me, and something about the recoil with it makes it takes more time for me to get back on target than any of the other firearms I shoot regularly. 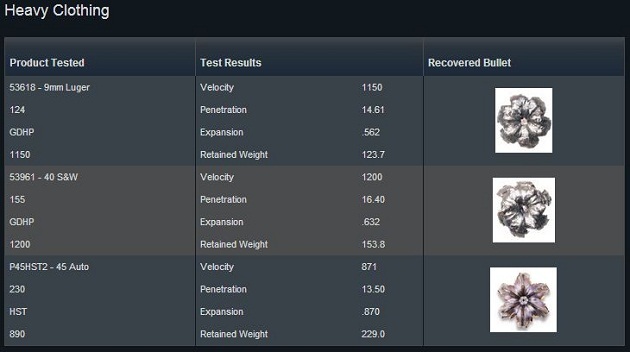 ONCE AGAIN ROBBIE, YOU ARE USING STATS AND CONTROLLED TESTS TO SHOW THE DIFFERENCE IN PENETRATION AND EXPANSION, ETC. THIS IS SOME HELP TO SHOW THE DIFFERENCES IN CALIBERS, BUT IN THE REAL WORLD OF FLESH AND BLOOD, THE 9MM PROVED TO BE AN INFERIOR CALIBER IN MANY WAYS, ESPECIALLY STOPPING A SUSPECT IN A SHOOTING SITUATION. MY DEPARTMENT STARTED OUT WITH 9MM GLOCKS AND WE FOUND OUT THE HARD WAY. IN POLICE SHOOTINGS, THE SUSPECT WAS BEING SHOT SEVERAL TIMES AND STILL WAS ABLE TO FLEE OR RETURN FIRE. THIS BECAME INTOLERABLE AND THE 9MM WAS TRADED IN ON THE GLOCK 40 CAL. IMMEDIATELY, AFTER THE FIRST POLICE SHOOTING, THE SUSPECT THAT WAS SHOT WENT DOWN AND OUT AFTER THE STANDARD DOUBLE TAP WE WERE TRAINED TO USE IN A SHOOTING SITUATION. THANK GOD OUR DEPARTMENT CHANGED TO THE 40 CAL. THE ONLY REASON WE DIDN’T GO TO THE 45 CAL. WAS THE SIZE OF THE PISTOL GRIPS ON THE WEAPON WAS TOO LARGE FOR SOME “FEMALE OFFICERS”. TO END THIS ARGUMENT, THE MARINES HAVE FINALLY WISED UP, AND WENT BACK TO THE 45 CAL.COLT. AMEN BROTHERS IN ARMS! MAY THE 45 LIVE ON AND BE THE DENFENDER OF OUR TROOPS BOTH CIVILIAN AND MILITARY!L AMEN! Thanks for commenting – next time turn the caps lock off, all caps are hard to read. While I appreciate your views there are a few things I want to point out in your comment. First, stats and controlled tests are the best thing we have in making somewhat informed decisions about ammo choices. These tests are based on the best we can do at re-creating human tissue to shoot at. Second, I have a hard time believing that just the switch to a .40 cal round was the game changer in officer involved shootings. There have been two in my county in the last year. The first one took out the suspect and the second one (only a few days ago) did not. They both took several Federal HST rounds from a Glock 22. Same department, same guns, same rounds. So what’s the difference? The person behind the trigger and where they placed the shots. Since you made the .45 is superior arguement I have a example for that too. Several years ago a department (city) in the next county over fired multiple .45 rounds into the front and side of a vehicle at the end of a chase. No rounds hit the driver and several hit the passenger. She survived and filed a lawsuit against the department. In that same county one year prior a deputy shot a suicidal male who pointed a shotgun at him. The guy took one round from the officers G17 9mm and died. And my last example is from a tiny little .380 round that according to some won’t stop anything. An officer that I worked with took one .380 round in the side (past his vest) during a traffic stop almost 5yrs ago. His name is carved into a marble wall in Washington DC. There are your “real world flesh and blood” tests. I am sure there are plenty out there where the 9mm failed and the .45 didn’t but my point with this article is; with currently available modern defensive (hollow point) ammunition caliber is not all that important anymore. The only way to ensure that any round brings an immediate stop to a threat is a well placed head shot. The last thing that I want to clear up is the entire USMC is not switching to the M1911 in .45ACP. Only selected Force Recon and MARSOC units are switching. They won’t be shooting hollow points through them either so it’s not a equal comparison. Thank you for taking the time and money to put this test together as well as document it. IMHO, one thing missing from the comparison is Energy which is the other side of the caliber argument. You touched on it with “Stopping Power” but referenced it to penetration. Penetration is what you want to de-pressurize the bodies circulatory system, i.e. drop blood pressure. Energy is the shock the body absorbs at impact which disrupts the nervous system and causes the body to shut down.E=MC2 is still valid. The ballistics of the .40S&W are impressive more so than the 9mm and the .45. for the brands tested. Again, IMHO it is not the end all to be all. Me, myself and I would take the .45 for greater temporary and permanent wound cavity, greater retained weight and diameter over an additional 3″ of penetration and 90 pound feet. But that’s me. In the end, shot placement does rule. A well placed shot with a .380 is better than a miss with a .50 AE. Again, thank you for the time and effort to put this together, it IS appreciated. FWIW, I’m retired Army and carry either a 1911, Sig220, XD45 or a Glock 20. I love the 40 ! That being said the ballistics are a little padded in a way. A 155gr bullet at 1200 fps is a warm load. The 124gr at 1150 is about average. And the 230gr at 871 fps is on the low side. For instance the 124 could be a +P+ at 1250 and that’s a game changer! And the 230 could be more like a +P with a 200 gr bullet at 1100fps……big difference. But this is what makes talking “GUNS” so fun! One more thing the Speer GDHP is the Best Load for my money! Keep up the fight for our freedom AMERICA ! ! !